← Girl looking for an apartment in Nashville. 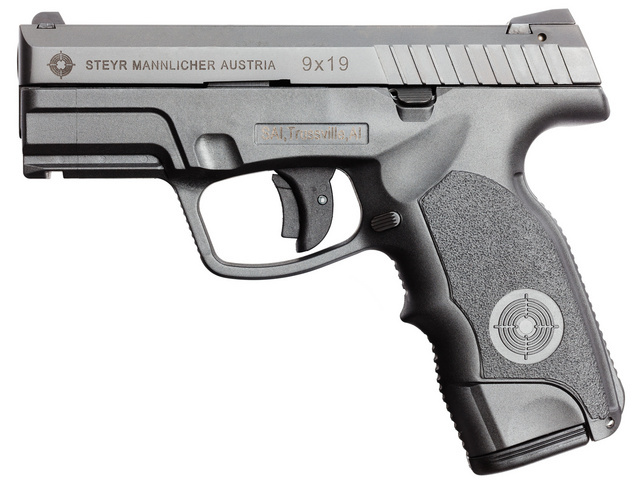 Way back in 2002 or so, I tried a Steyr M9. I liked the trigger, the thin comfortable grip and the lack of recoil, wasn’t sure about the sights and really did not care for the safety lever placement. Ten years later, I get to play with the A1 version of all three variants, full size M, shorter than but full-capacity C and small S). The annoying safety has been omitted, the rest is the same as before. I am a slightly better pistol shot now, so I will give the sights another try. Dennis at Dragon Leather works made a velociraptor hide belt holster that fits all 9mm and .40 variants. It is long enough to enclose the entire full-length slide. 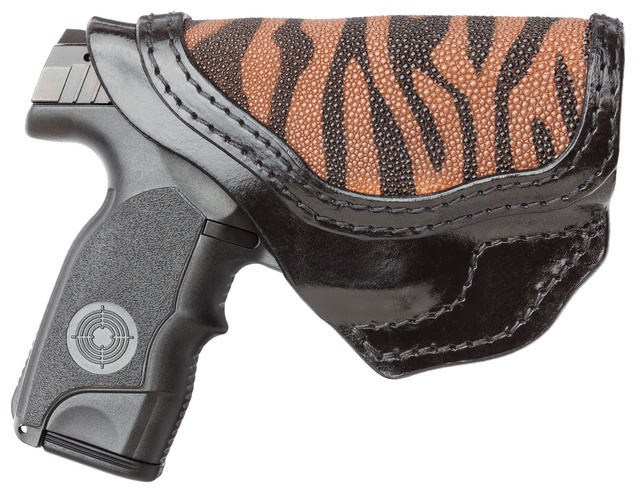 This entry was posted in holster, pistol and tagged 9x19, leather, polymer, semi-auto, Steyr, striker. Bookmark the permalink. I’ve got an M9-A1 and love it, especially the sights. They take a bit of getting used to for precision work, but they’re truly great for rapid target acquisition. Oh I like those sights. Is there a way to get them separate with various dovetail cuts for other guns? I have suresight.com s on my main tottin pistol and love them but they’re impossible to get because the maker may have had great ideas but he seriously sucked at the business part. #4 is my favorite. It was the reader, by the way. Thanks. I still think the notion of having the “safety” on the trigger is one of the dumbest firearms-engineering ideas ever, much less the dumbest one ever widely adopted into mass production. It’s a useless gimmick: either make a pistol with no safety at all for those people who don’t want one, or put a REAL safety and/or firing pin block on it. 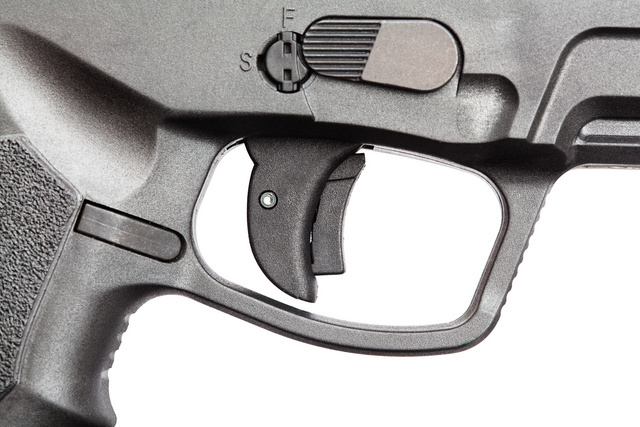 This design is even WORSE, because not only does it have the silly trigger-safety, but the other thing that passes for a safety is too ridiculously close to the trigger, where your trigger finger should be indexing to the frame, and I can see great potential for accidental/negligent discharge as a result of trying to manipulate it. The “safety” you are mentioning is a lock requiring a key to activate. It’s for long-term storage (not useful, to my mind). 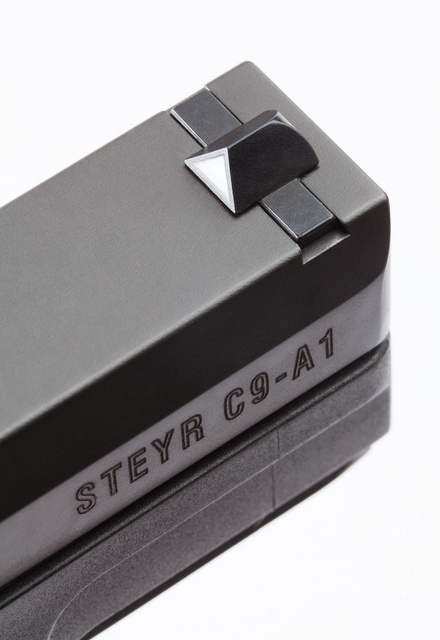 The trigger-safety is more of a two-stage trigger than a true safety, so the real safety device in C9-A1 *is* the firing pin block. Your “other thing that passes for a safety” is the takedown lever and a key-activated lock to disable the pistol for storage (so that if your little gremlins find it, the entire gun is disabled). I agree with your first part about the “trigger safety” being a stupid idea and it’s why I’m very hesitant to use a striker fired pistol without a secondary safety for CCW. 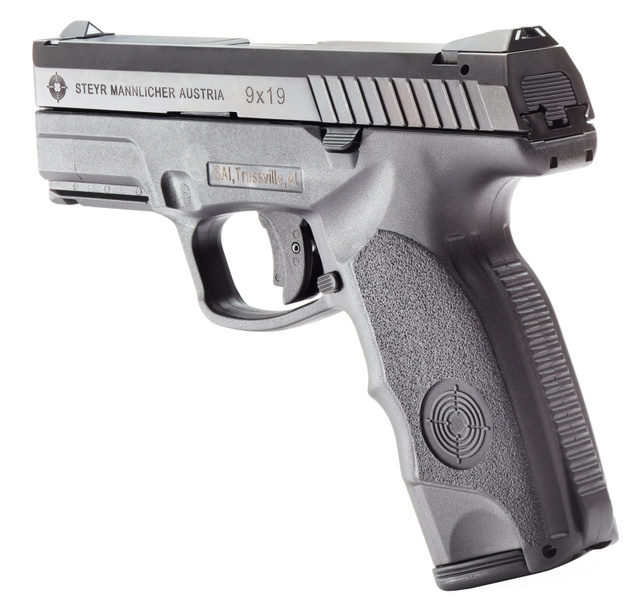 I prefer the XD model of having a grip safety so that there’s no extra steps involved with firing the gun – just draw and shoot – but there’s no way it will go off unless you’re firmly holding the gun. 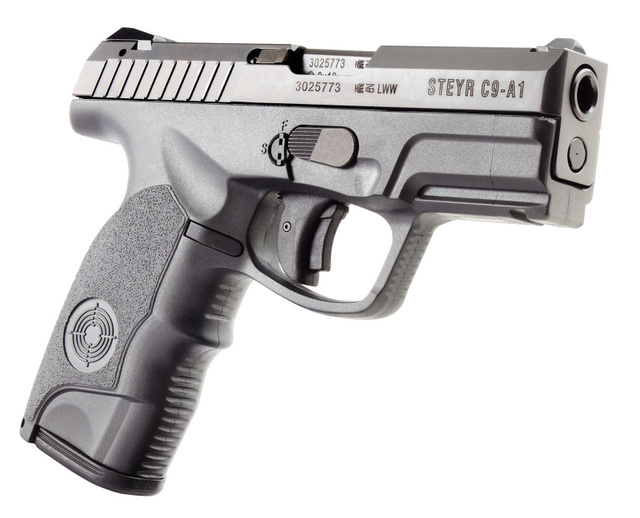 I first tried a Steyr M9 when my son got one on his return from the Marine Corps in 2004. Just looking at them and trying to line them up, I hated those sights. Then we went out shooting; on the return home I realized I hadn’t even noticed the sight. They are not target sights but rather are optimized for self defense. As you look at the threat the lines of the sights just all work to point at the target in one’s peripheral vision. 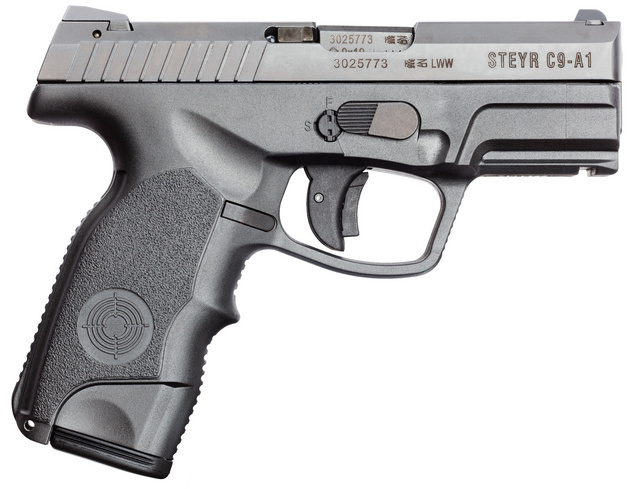 I had the chance to trade a Glock 22 for a Steyr S9 a few years later and have never regretted it. And, for what it’s worth, I LIKE that Garand-style safety in the front of the trigger guard. What I don’t like are the Glock-style, mis-named “safe trigger” unsafeties. Is that a left-handed magazine release I see? Is that a special model (like the V2 that HK has for their USP), or is it a reversible release? Ooops! Never mind. On closer inspection I see it’s a right-handers release. Hey, is that the DL model holster from Dragon? I really like the look of that one and will really think about it if it fits my SW .40 SVE. Of course, Dennis has MANY carry options, and I’ve heard you can’t go wrong with any of them, it’s just which one do you want. Not sure which model but he would know. Dennis is awesome.